Movie Review: Atlas Shrugged | What Would The Founders Think? Having just returned from seeing Part 1 of Atlas Shrugged my advice to all who haven’t seen it is, pay no attention to the terrible reviews. It is very clear why the movie calls forth such venom. The message is simply unacceptable in today’s dominant political culture. The movie opens in 2016. We see an America where nothing works, not the machines and not the people. The streets are lined with homeless people and derelict automobiles. The airports are littered with wrecked planes. The remaining railroad is run by a smug James Taggart who is ruining the company he inherited, but is very good at articulating concern for those “who need our help.” He depends upon his Washington connections to keep the company afloat. He condemns his sister, Dagny, for wanting to save the firm the old fashioned way, by making it profitable. Henry Reardon, the protagonist, is a steel tycoon who also disdains Washington. Instead, he concentrates on developing high strength steel that will transform the industry, and help put the country back to work. An association of scientists, beholden to the Washington power clique, brands Reardon steel unsafe. A union boss tells his members to refuse to drive trains that run on “unsafe” Reardon tracks. Congress limits trains using a new engine that can produce speeds far beyond any in the history of railroading, to 60 miles per hour. All of this and more are done in the name of advancing the general welfare. Meanwhile, important personages gush about taking care of the less fortunate, while making sure that they won’t run out of them any time soon. Well-heeled lobbyists, who do well by claiming to do good, see to it that no business or innovator is allowed to do better than the firms they represent. Success is punished because it leads to inequality, not to mention putting incompetent firms out of business. Entrepreneurs are forbidden to own more than one company. A compliant Congress is well rewarded for passing helpful legislation. One of these bills bars successful companies from relocating to successful states. No state is allowed to be more successful than other states, and those that are will be punished with high rates of taxation. Sound familiar? It is clear that in the America of 2016 portrayed in Atlas Shrugged, the Constitution has become irrelevant. The resemblance to what is happening today is impossible to ignore. Think Boeing, Al Gore, the EPA, and a Supreme Court majority appointed by Barack Obama. At the end of part 1 we learn that those people have gone somewhere the government doesn’t punish success, but where success creates its own rewards, a place where incentive and innovation are not smothered by an over-reaching, over-bearing government. That place used to be called America. I hope they make the remaining parts of this story. It’s been nearly 30 years since I read Atlas Shrugged but I may have to pick it up again. I took my wife to see this film as she had just finished reading the book. From my dim recollection and her clearer one, we reckoned that the movie remained fairly true to the novel. Whilst I don’t recall all of the different story lines in the 1100+ pages, I do remember the boiling anger and frustration that reading it engendered in me as I read it in the midst of an accounting class in the summer of 1983. (I remember even less of the accounting class!) Even back then, I recall thinking that it was uncomfortably similar to what was happening. The country had just survived the disastrous Carter presidency. Some of the dialog was a little flat, but this was almost a relief because it reminded me that this was after all, a movie. To be sure, this updated film still has a bit of a surreal quality about it, but unfortunately not enough. In Marcia’s review she referred to the recent hullabaloo regarding Boeing’s new plant in South Carolina. The National Labor Relations Board is suing Boeing for having the audacity to extend their operations in a more business friendly environment. The movie’s script and filming took place well in advance of this event. Nonetheless, it could not have hit truer to the mark. One of the many “news clips” featured in the movie is about a law passed by Congress that prohibits businesses from relocating to different states. Another key element in the movie was the enormous influence wielded by unelected bureaucrats in various agencies. This was surely ripped from the headlines of today. Anyone who’s not asleep will draw parallels between events in the movie and recent actions by the EPA, the FCC, and of course the NLRB. 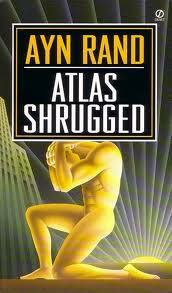 Atlas Shrugged was entertaining but too close to reality to force one to suspend disbelief. No forcing was required. There wasn’t a whole lot of fantasy in the film. The movie rekindled the frustration and fury I felt in reading the book. The actors were competent and did a good job of portraying the characters as I recalled them. Hank Rearden’s portrayal was especially apt. His easygoing demeanor and self-assurance were dead on. The movie ends with its most powerful scene. Dagny Taggart’s anger and pain at seeing the Colorado oil fields in flames is palpable and powerful. When the camera pulls back and shows a bit more of the picture, you can feel Wyatt’s righteous indignation … and share it. Hans and I saw the movie this past weekend. The acting is not bad, the sets look vaguely 1930’s with a modern twist. And it is as honest and true to the book as a movie can be in a short time. However, unlike movies today, people actually talk and discuss ideas, politics, and philosphy. It was clear to us that most in the audience were Ayn Rand fans and sometimes people could not contain their remarks to Mounch and derisive laughter at what was happening in Congress. I know why the reviews denigrate this movie. It might just get people to realize that what Rand was writing about is happening today. My husband and I were the only two people in the afternoon showing of Atlas Shrugged in a theater in Coeur d’Alene, Idaho. We thought Dagny Taggart and Hank Reardon were perfectly cast. James Taggart was a disappointment. Marcia’s review gives an accurate summary of the movie’s events and message. I am crossing my fingers that the movie is a success and encourages the producers to make #2 & #3. I was impressed that a low-budget production could be done so well.